I have long been a fan of Robert Dickerson’s work. From a very young age his charcoals and paintings have moved me. He has an incredible ability to capture both the strengths and the frailties of human existence, especially in his charcoals. 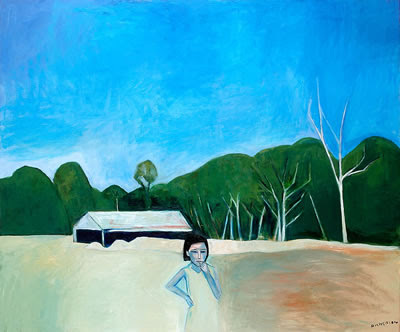 His works can be melancholic, dark and moving, but also joyful and humorous. 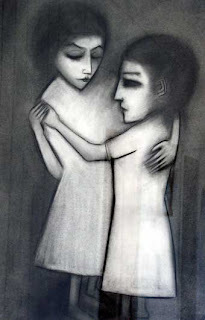 My Dad and I share a love of one particular Robert Dickerson work called The Dancers (pictured), a beautiful charcoal of two women dancing together. From what we have been able to gather it was based on dances held out at the Brookfield Community Hall, a beautiful little country community just outside of Brisbane. At a time when there were not a lot of men around (Second World War perhaps?) the women often had to dance with each other at these gatherings. There is something so sad yet so comforting and beautiful about that scenario. His work is showing at Big Phil’s gallery in Fortitude Valley until July 28th. Better hurry! Some more links here and here. I am in lllllove with charcoals.